12-string electric guitars have marked the musical landscape with their beautifully lush, naturally chorused sound. 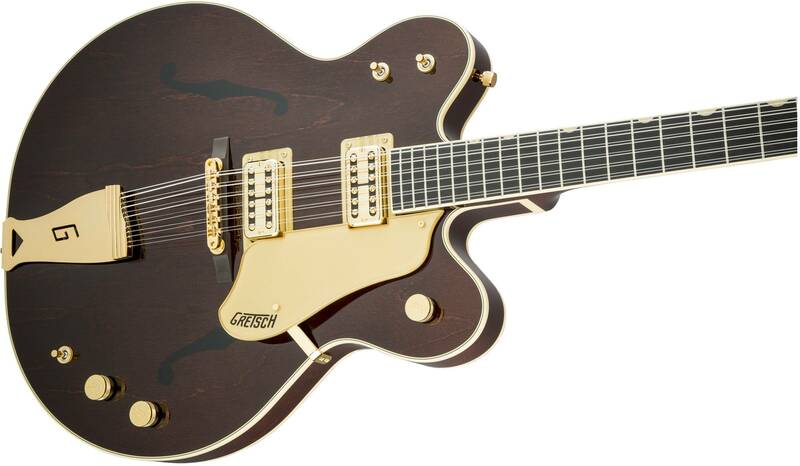 The G6122-6212 Vintage Select Edition '62 Chet Atkins® Country Gentleman® Hollow Body 12-String brings that one-of-a-kind, authentic ‘60s style and sound into the spotlight once again. Plug one in today and enjoy a full, larger-than-life playing experience that is like no other. TV Jones® Classic pickups deliver refined, articulate tone that responds to every pick stroke or strum. 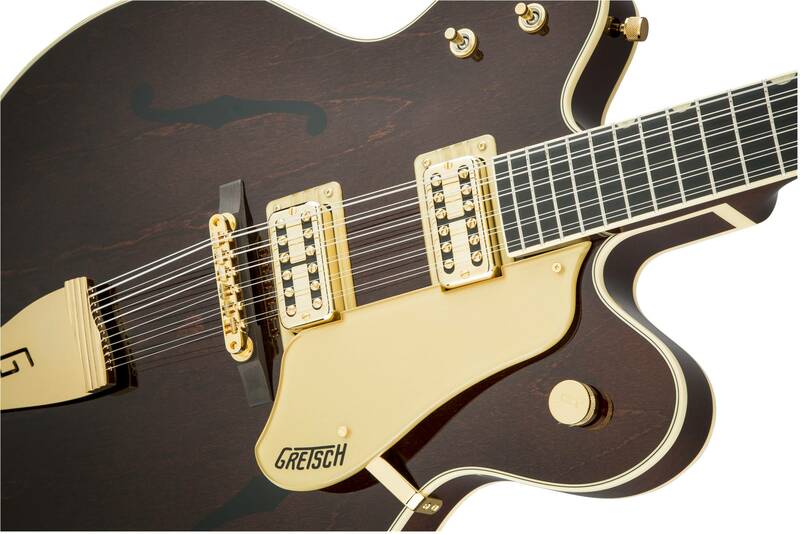 Traditional Gretsch controls—including per-pickup volume controls, master volume, three-way pickup switching and a three-way tone switch—allow you to blend the pickups to create countless tonal variations, personalizing your sound. Add the new Gretsch “Squeezebox” paper-in-oil capacitors and you get incredibly silky vintage high end. The standard “U”-shaped maple neck bears a 12”-radius ebony fingerboard with 22 frets for a memorable playing experience that works with any fret-hand style. The sealed body with simulated F-holes minimizes feedback while providing for authentically vintage hollow body tone. 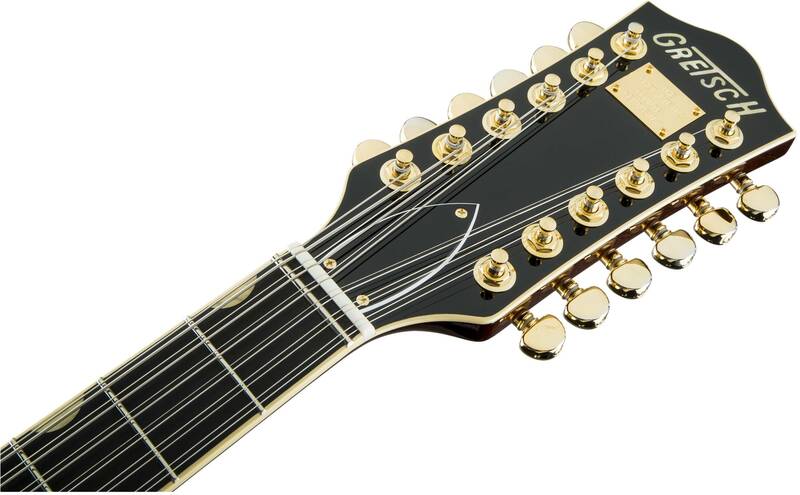 The pinned Adjusto-matic™ bridge allows you to precisely adjust the guitar’s intonation, ensuring all 12 strings play in tune along the length of the neck while the G-cutout tailpiece adds a touch of vintage style. 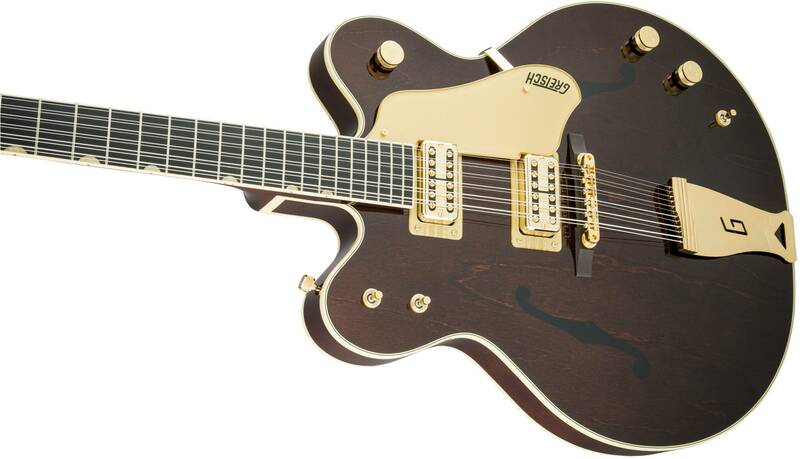 A lush music machine, this guitar features the classic appointments Gretsch aficionados desire—laminated 3-ply maple top with painted F-holes, gold G-arrow control knobs, aged white binding with black purfling, gloss urethane finish, aged pearloid thumbnail inlays, gold, vintage thick plexi pickguard with Gretsch logo and gold Grover® Rotomatic® mini tuning machines. A full-sounding guitar, the G6122-6212 Vintage Select Edition '62 Chet Atkins® Country Gentleman® Hollow Body 12-String is the perfect instrument to enhance your sound with open, airy chordwork.